Maria Santos in the lab with the mobile robots. Researchers at the Georgia Institute of Technology have recently carried out an interesting study exploring how motion and shape descriptors that are associated with particular emotions can be incorporated into swarm behaviors to create evocative artistic expositions. Their research, recently published on arXiv, combines engineering and robotics with artistic expression in an innovative way. "I have always been interested in the arts, as I am a musician myself," Maria Santos, the study's principal investigator, told TechXplore. 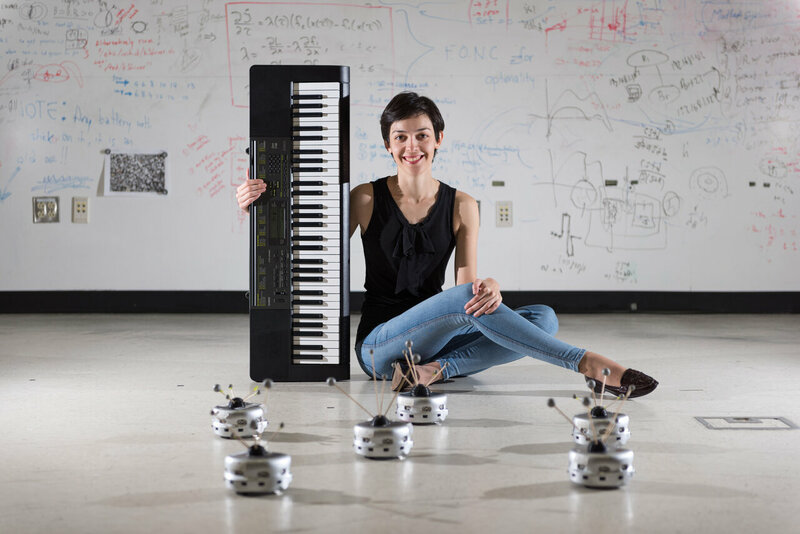 "When I arrived to Georgia Tech as a graduate student in Electrical Engineering, I was offered the possibility of doing some research with Prof. Magnus Egerstedt that combined music theory and swarm robotics as a way of creating meaningful human interactions with the robots and I immediately got excited. As that research progressed, we wondered how to use a swarm of robots in performances such as music concerts or theatre plays, and how these small, relatively simple robots could convey a message to the audience, just like artists do. That is when we realized we should study the relationship between motions and emotions." In their study, Santos and Prof. Egerstedt used concepts from social psychology related to the expression of emotions to create a new set of swarm behaviors. Each of these behaviors is designed to depict a fundamental emotion in a creative way. In psychology, 'fundamental,' or 'basic' emotions are the six key emotions expressed by humans: happiness, surprise, anger, fear, disgust and sadness. To effectively convey these emotions using a swarm of miniature mobile robots, the researchers developed new behaviors inspired by shapes and motions rooted in social psychology theory. "Behaviors associated with positive emotions (happiness and surprise) are based on round shapes," Santos explained. "In the case of happiness, the robots joyfully move along a circle with ripples at a moderate speed. For surprise, the radius of the circle expands with time, making the robots spiral outward." To express negative emotions, on the other hand, the robots move in a jerky and erratic way, as social psychology theory associates such emotions with more unstable types of movements. For instance, to represent sadness, the robots move in a circle at a pace that Santos describes as "painfully slow," while for fear, the robots scatter over the stage in a fragmented way, as if they were afraid of each other. "To display disgust, the robots move slowly from the center of the stage to its boundaries," Santos added. "Finally, for anger, the robots move aggressively toward each other at the center of the stage, giving the illusion of a heated argument. " To evaluate the effectiveness of their swarm behaviors in conveying basic emotions, Santos and Prof. Egerstedt asked 45 people to watch videos of robots performing these behaviors and then complete a survey. They found that most participants who had observed the robots' 'performances' were able to correctly guess what emotion they were supposed to portray. "Given that the robots in the swarm are very simple and do not have a face or a body, it is remarkable that these simple behaviors are directly identified by the spectators as conveying the intended emotions," Santos said. "This suggests that swarm robotics has a lot of potential to be used in artistic performances." The study carried out by Santos and Prof. Egerstedt suggests that social psychology theory, particularly abstract descriptors associated with the fundamental human emotions, could inform the development of expressive and evocative swarm behaviors. In the future, these behaviors could help to create fascinating new performances and artistic displays, in which robots play an active role. "We now want to continue expanding this framework of using robotic swarms in artistic expositions and performances by introducing widely used elements for scenic arts, such as music and dance," Santos said. "For example, one could think of a swarm of robots as a dance troupe to support a performance: how should these robots move to the music to fit the particular style of the musical piece but also the emotional landscape of the performance?"